On Oct. 30, 2014, a Bureau of Reclamation (BOR) water quality sampling crew collected water samples across Deer Creek. The water samples were later analyzed by a BOR lab. On Dec. 12, lab technicians, looking through a microscope, found what appeared to be five quagga mussel veligers in a sample taken near the dam. The DWR requested that the samples be genetically analyzed to learn whether they were in fact quagga mussels. Through DNA testing, both the BOR lab and Pisces Molecular, a private third party, confirmed that the veligers were quagga mussels. Nielson says it's impossible to know where the veligers came from. 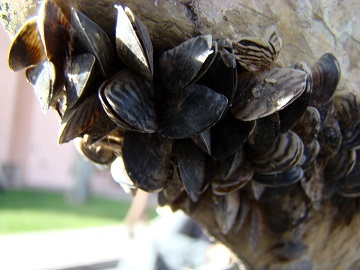 "The lower end of Lake Powell," he says, "as well as other reservoirs on the lower Colorado River, have a rapidly growing population of quagga mussels. It's possible that someone who was boating on a lake with quagga mussels accidentally brought the veligers to Deer Creek. We'll never know for sure." clog pipes that deliver water. The cost to remove the mussels could cost water users in Salt Lake County and Utah County millions of dollars. filter tiny organisms, such as zooplankton, out of the water. Fish rely on these organisms for food. A quagga mussel infestation could affect fish populations in the reservoir, which in turn would affect fishing. form massive colonies on popular shoreline areas. The mussels smell bad and can cut your feet when you walk on them. clog your boat's cooling system. This can cause your boat to overheat, leading to costly repairs. Clean, drain and dry your boat. You can see how to do this at www.stdofthesea.com. Have DWR or Utah State Parks personnel decontaminate your boat. The decontamination is free. You can find the closest unit by visiting www.stdofthesea.com. At the site, you'll find contact information for the DWR aquatic invasive species biologist in your region. The biologist can direct you to the nearest decontamination unit.